RightMesh, a project of Left, is growing! As the RightMesh team moves aggressively towards their Soft Mainnet Launch, they have grown their Tech Team with two new engineers. We are pleased to welcome Dean Neumann as our VP of Engineering and Ming Hu as our Senior Software Engineer to the Left family! Our new VP Engineering, Dean Neumann, joins RightMesh with over 28 years experience in the software industry including key executive and management positions. At Intel, for example, Dean led strategic planning on advanced technologies to define technology developments required for the telecommunications and embedded markets. For the past 7 years, Dean has been CEO of Malaspina Labs Inc — concurrently serving as acting CTO from 2013–2017. While there, Dean directed research scientists in the creation of machine learning architectures for speech recognition and executed an organizational pivot from being a royalty-based software provider to pure IP licensor. The opportunity to work on self-forming, self-healing, and self-regulating mobile mesh networks and its use cases most excited Dean about the prospect of joining the RightMesh project. 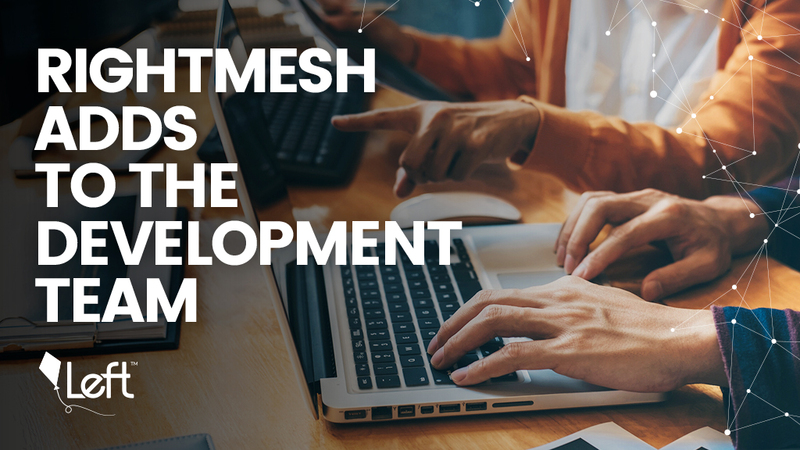 In the short while that Dean has been part of the RightMesh team he has already implemented effective changes within the organization such as introducing new processes to streamline development. When not working, Dean enjoys tinkering in his electronics lab and machine shop, creating glass art, and ice climbing in the winter! Ming joins our team as our newest Senior Software Engineer. With a Master’s Degree from Tsinghua University in China and over 15 years experience in software development, Ming brings a plethora of knowledge to share throughout our organization. Ming’s background has included key engineering roles in both larger corporations and successful startups, such as Best Buy, Elastic Path Software and GPower. Ming decided to join RightMesh because of the opportunity to work with cutting edge technology being developed in-house. He is most excited for the opportunity to bring connectivity to those in rural regions which do not have access to, or cannot afford it. Ming feels that the RightMesh project will be able to contribute to decreasing the digital divide by providing last mile connectivity. We are very excited to welcome both Dean and Ming to our software engineering team. Their work so far has already made positive impact in the process and building of the RightMesh platform.